A sweetheart of a boat that's easy to build. The BULL'S-EYE is an ideal first time boatbuilding project and a great way to get into boating. 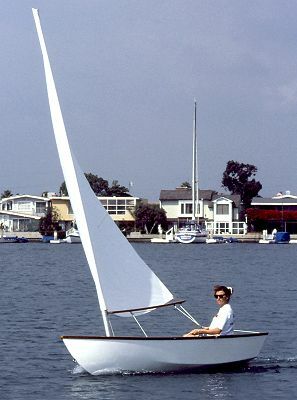 The BULL'S-EYE utilizes Fast-G Stitch and Glue construction; the plywood planking is cut from standard 4' x 8' panels, assembled flat on the ground, and folded to form the boat. A pattern is furnished for virtually all contoured parts. More than 25 full-size patterns, including planking. Just lay the patterns over the wood, transfer to the wood, and saw to shape. No complex grids or tedious layouts from dimensions are required with Glen-L Fast-G construction. The BULL'S-EYE is versatile, easy to row, and adapts readily to a small outboard. Graduate to sail with the simple free sanding cat rig, or for a more lively craft, use the fully stayed sloop rig. The traditionalist may prefer the classic sprit rig with wood spars that can be carried inside the boat for portage. Why delay? The water's waiting and now is the time to start.